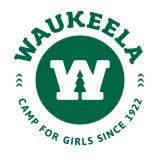 Even though we consider our entire Waukeela family to be sisters, each new camper also gets a specific camp big sister who will help her transition into life at camp! A month before camp begins, your daughter will receive a letter from her big sister introducing her to life at Waukeela! On opening day your big sister will show you around, introduce you to friends and help with any first time camp jitters. Big sisters serve as fantastic mentors to our new campers and are there to help answer any questions your daughter may have about camp. With the support of counselors, cabin mates and your big sister, you will be all set at Waukeela!